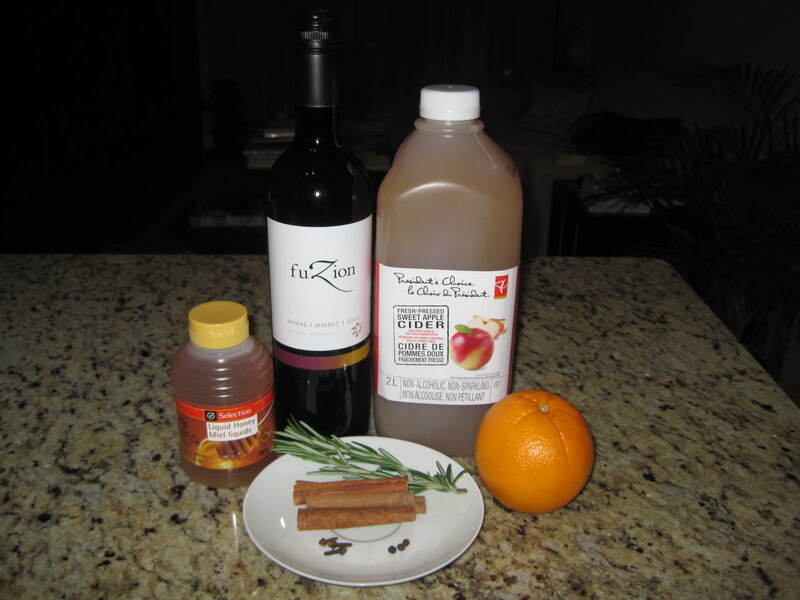 For this experiment we prepared mulled wine using three different methods. Slowly bring all ingredients except brandy to just below a simmer. Keep below a simmer for 20 minutes, then stir in brandy (if using) and serve, garnishing each glass with a sprig of rosemary. We found this method yielded superior results compared to the other versions. In a saucepan, simmer 4 cups apple cider, 4 tsp brown sugar and 4 Tbsp of mulling spices. Heat on LOW for 30 minutes. Strain and serve warm. I had to tweak the directions that were on the back of the label in order to adapt it for making mulled wine (the recipe provided was for making mulled apple cider). It called for adding 4 Tbsp of mulling spices along with some brown sugar to 4 cups of apple cider. This seems like quite a lot from a spice:cider/wine ratio but I figured I would take on the persona of a person who had no previous experience making mulled wine (which may be why they were buying pre-packaged mulling spices). 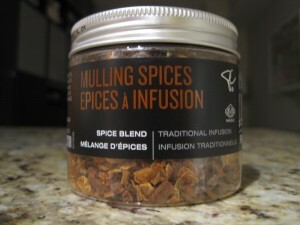 I modified the mulled wine recipe I was using to accomodate these spices. 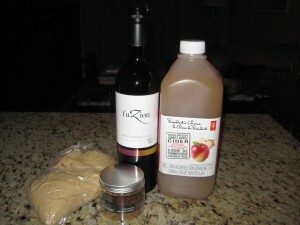 I combined the wine, apple cider and mulling spices and used the brown sugar that the recipe stated (instead of honey). I figured that this would give comparable results (although I still think that 4 Tbsp of mulling spices for 1L of liquid is total overkill. This mulled wine had a very strong, almost bitter and flat flavour. The spices were very overpowering. This is despite the fact that I tried to ‘brighten’ up the mulled wine by adding some orange slices (I did this will all of the mulled wines we prepared). This method is also the most expensive out of the bunch. You are better off buying your own separate spices (you don’t need much) and adding them in yourself. This method was the simplest of the three. I used a mulled apple cider that already had spices and flavourings added thinking that could eliminate the step of adding additional spices. 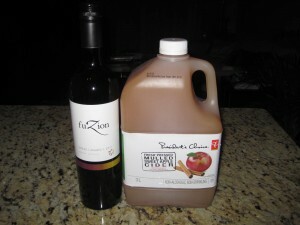 On it’s own, mulled apple cider tastes delicious (I call it apple pie in a cup). However, we learned that using mulled apple cider for mulled wine resulted in very poor results. 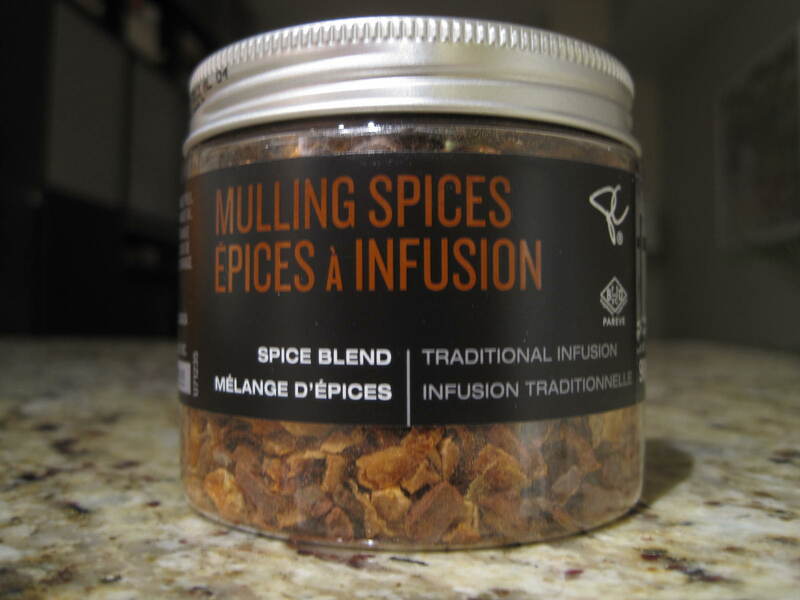 You really need to mull fresh herbs and spices when making mulled wine in order to release their flavours. Using mulled apple cider results in a very flat, one dimensional tasting mulled wine that was not enjoyable to drink.